NEW YORK, Aug 13, 2014/ — The more things change, the more it stays the same… Did you know that prior to 1840, brides choose all kinds of color for their wedding other than white? In fact, choosing white is almost unheard of because it is thought of as an impractical color. But Queen Victoria changed all that in 1840 when she married Prince Albert all dressed in white. And as the news crossed the English Channel to the European continent and across the Atlantic to the Americas, the elite started wearing white not only to follow a trend but also as a symbol of conspicuous consumption. White was favored primarily as a way to show the world that the bride’s family was so wealthy and so firmly part of the leisure class that the bride would choose an elaborate dress that could be ruined by any sort of work or spill. Over 170 years had passed since then and we are now in the 21st century. Brides are again being given the choice of wearing white or a different color altogether. And if you ask Vera Wang, famous for dressing the rich and famous and the most discerning brides, she will suggest PINK if you are getting married this fall. Petal strapless silk organza ball gown with hand draped bodice accented by organic flower, grosgrain shoulder strap and peony faille blossom. Petal strapless silk ball gown with hand draped tulle bodice and organic flower detail accented by silk organza ruffles. 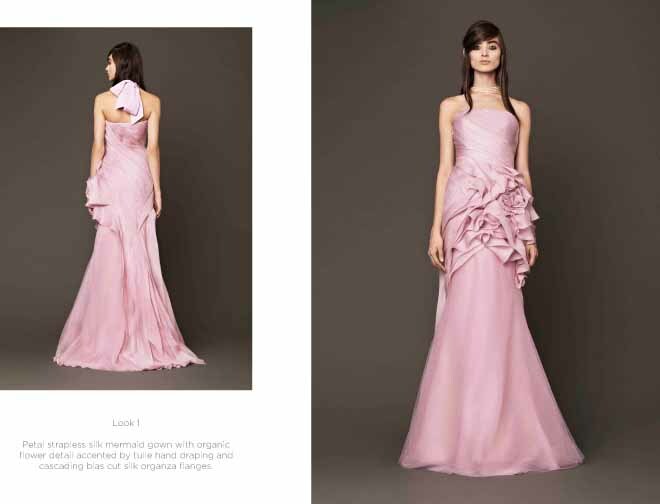 Petal strapless silk gazaar ball gown with hand draped bodice accented by exposed corset neckline and peony organic pleated flower. Rose strapless silk ball gown with hand appliqué Chantilly lace bodice, grosgrain bows and draped skirt accented by crystal pleated tulle detail. Rose strapless silk sweetheart mermaid gown with hand draped tulle detail accented by circle cluster lace and floral beaded embroidery. Rose strapless silk ball gown with hand draped tulle bodice accented by vermicelli beading at neckline and skirt with floral beaded embroidery. Coral strapless circle cluster and butterfly lace ball gown with tumbled tulle accented by organic flower detail and floral beaded embroidery. Coral strapless silk mermaid gown with organza flange detail accented by faille blossom, pleated organza and floral beaded embroidery. Coral strapless hand pleated silk faille and honeycomb tulle mermaid gown with horsehair ribbons, organic flower detail and floral beaded embroidery. Coral underlay with hand applique Chantilly lace and floral beaded embroidery. Coral strapless silk ball gown with hand appliqué Chantilly lace, gauze draping and floral beaded embroidery. Coral strapless chiffon mermaid gown with alternating pleat bodice, organic flower detail and pleated tier skirt. Peony strapless faille ball gown with hand draped bodice, open back detail, faille blossom and floral beaded embroidery. Peony strapless faille sweetheart mermaid gown with double bow back detail and floral beaded embroidery. Peony strapless faille ball gown with hand draped bodice and coral floral beaded embroidery.